I apologize for being missing in action lately. I think I have a good excuse. My husband travels extensively with his job, and in addition to his regular travels he is filling an interim position in the San Diego area until they find someone permanantly. Oh, and they asked him if he would be willing to interview for this position? That's like HUGE. We thought we'd be here a very long time. Proof? 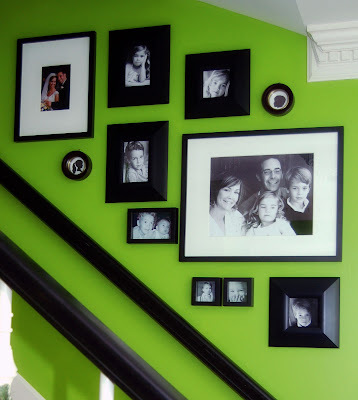 We painted the entry hall kelly green last winter, remember? We love it here, love being close to Jennifer, the grandkids, our friends and church. But the fact that this might allow Tim to not have a plane strapped to his back, and honestly...we're talking San Diego, he agreed. So I went out there with Tim to research the different areas of town and check out the real estate market. I got on my computer every day studying, making lists and when Tim got back from work we'd hop in the car and drive around the different parts of town until way after dark. We spent the weekends doing the same and visited numerous open houses. So what did I learn? I discovered my home is worth millions! There...not here. The most expensive homes in the US are in California and the least expensive are in the Midwest. Oh, remember that little cottage I photographed in May and affectionately named the Keebler Cottage? Well, it's for sale! $2.3 mil for 1900 sf. Yup. Okay, it is among the most incredible homes in the 6th most expensive town in the whole US. But that puts the whole home search in perspective, doesn't it? We don't even know whether Tim will be offered the job or if he will accept the offer. However, because I don't want to necessarily find myself living in a cardboard box I am determined to have enough info under my belt just in case. I was welcomed back home to a box of my fabric strike-offs! Well, not all of them, sigh. But what I do have is pretty exciting. I so want to see it all laid out together so I've been holding out for a few days in hopes the rest will arrive. 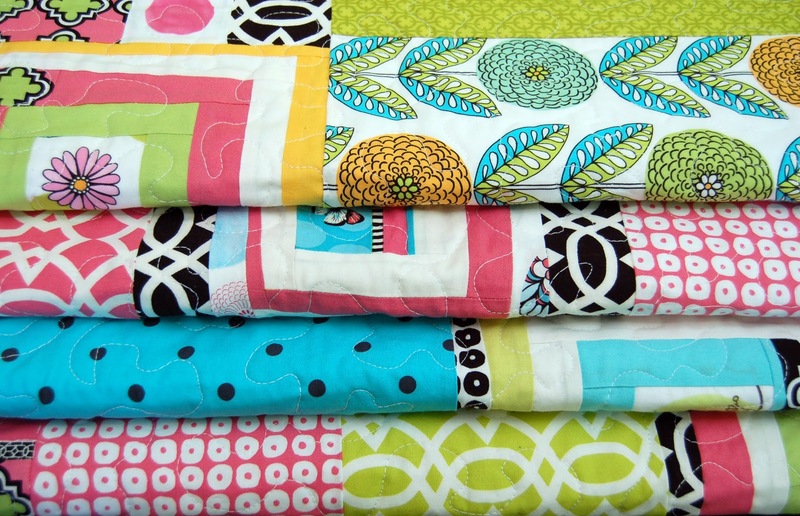 Another pleasant surprise is that the Quilts for Quads are complete! And before the kiddos are actually walking, right? No, no, just kidding. Seriously, they should be able to roll around and gurgle and coo on these for some time. I spent the last day walking around here trying to figure out how to photograph each one. So I finally gave up and here ya go for now. The next major project, I'm hoping, is to gather us gals together to celebrate our accomplishment, those babies, get a group pic and maybe, just maybe, get a peek at those miracles in person. 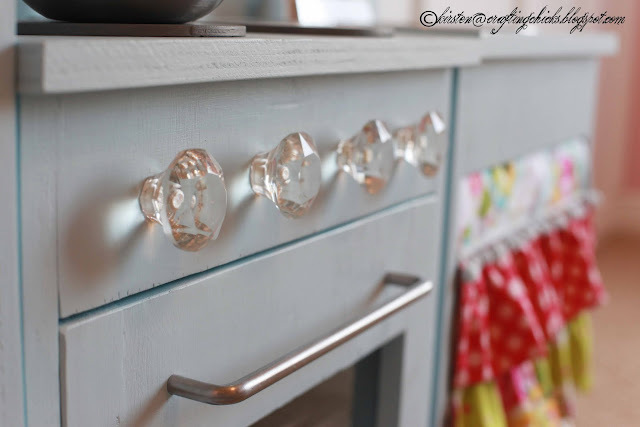 Oh, and have you seen this child's kitchen? Talk about custom cabinets! Besides the fact that I love the fabric, I was fascinated that this was made from scratch. Go over to visit Kirsten Wright at the The Crafting Chicks. She tells you how to make one of your very own. I'm thinking I need to hold on to these instructions in case that cardboard box becomes a reality. Labels: FABRIC DESIGNS, QUILT MARKETS, QUILTING. 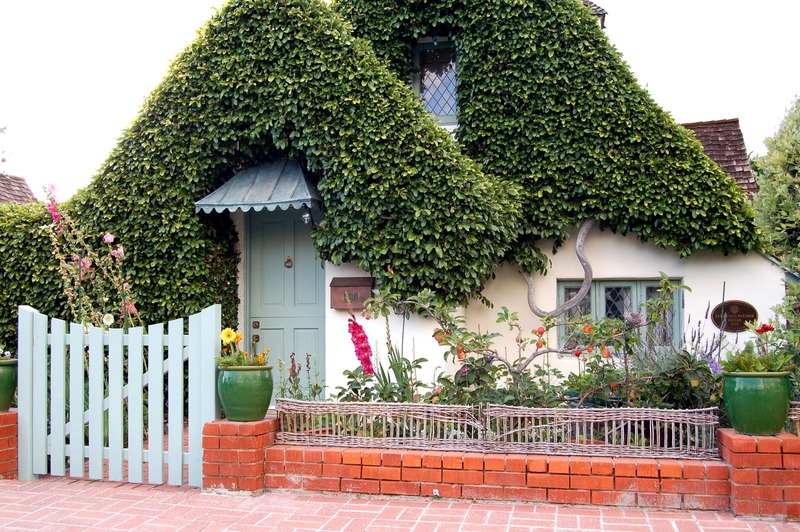 talk about stinking cute...both the kitchen set and the keebler house (although after seeing what ivy can do to a building, I think that could be a serious problem and at least bring it down to 1 million dollars) Best wishes on the move, and house hunting. Cannot wait to see your new line!! when will it be out? 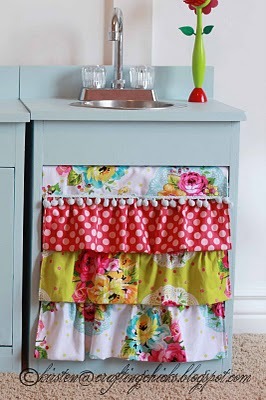 Adorable kitchen, I went the easy route and bought one for my kids, well actually I bought it with a gift card I won, so I can feel thrifty, if not crafty. 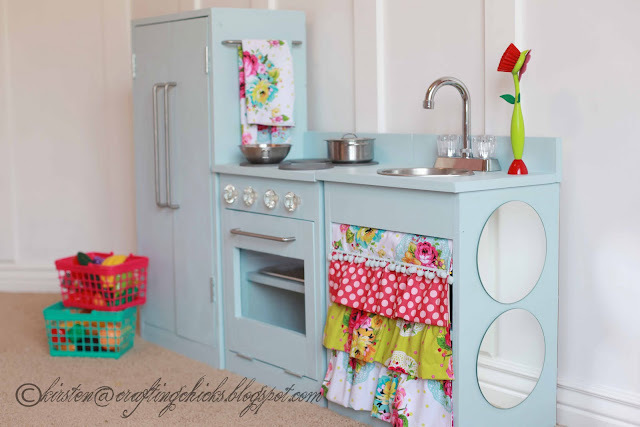 I want to make one of those kitchens for myself!! Oooo that is huge- at least it is a beautiful place and I am sure you could probably move into a cardboard box and transform it into something incredible! I want to move into that house. Oh my gosh, I love it.